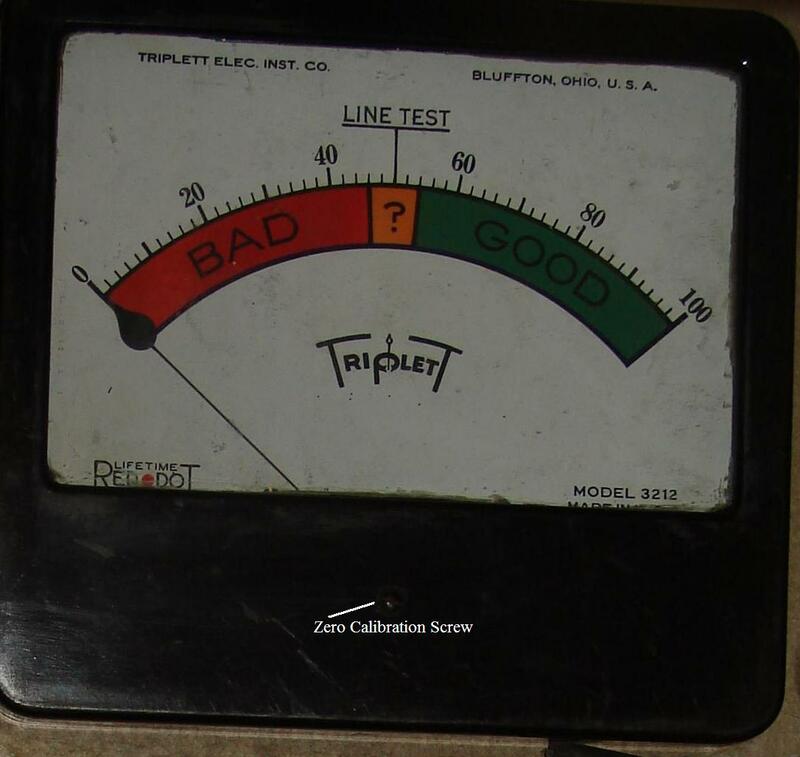 A Quick Overview of Tube Testing… | Miscellaneous Circuits and a link. ← Halloween is coming up, build a “Frank’s Box” and see what you find. A few notes here, mainly on tube testing and just some commentary on why tube sound is popular. Visually, you cannot tell merit of a tube, but you can at least determine if it has damage to the seal or the envelope by the way the “getter flash” appears. If it is shiny, the seal is at least adequate. If it is white- the seal is gone or the tube is damaged. The “flash” is the final production step where a high voltage is applied to the pin the getter is attached to and an external “anode” is wrapped around the tube. The Barium compound becomes transferred to the glass by the electron flow and chemical reaction in the process, remaining gasses (primarily those that are reactive to metals) are bound chemically with the barium compounds through the chemical reactions. First, there is no perfect test or tester. Some cost more than others because of how they go about establishing a reading and this reflects the sophistication of the tester. The basic testers are “Emissions” testers. These work but are not great when it comes to matching tubes but if nothing else is available, they will allow some degree of matching accuracy. Also if an emission type is all you have available, and you are trying to match tubes, you need to strive for the same reading on the meter for both tubes or tube sections. What does “Tube balancing mean? and is it impotant?”. Tube Balance: simply means that either 2 tubes in the same location in the circuit of a stereo have the same measurement of performance, or when they are in a “push- pull” circuit (usually an audio output), the tubes should have the same value so the output waveform is correct and balanced above and below the “Zero Crossing Point” because one tube is amplifying the upper half of the wave and the lower half of the wave is handled by the other tube. Depending how an amplifier is wired determines how critical the tube balance is for decent performance, but it is always better to have tubes with the same performance working together. 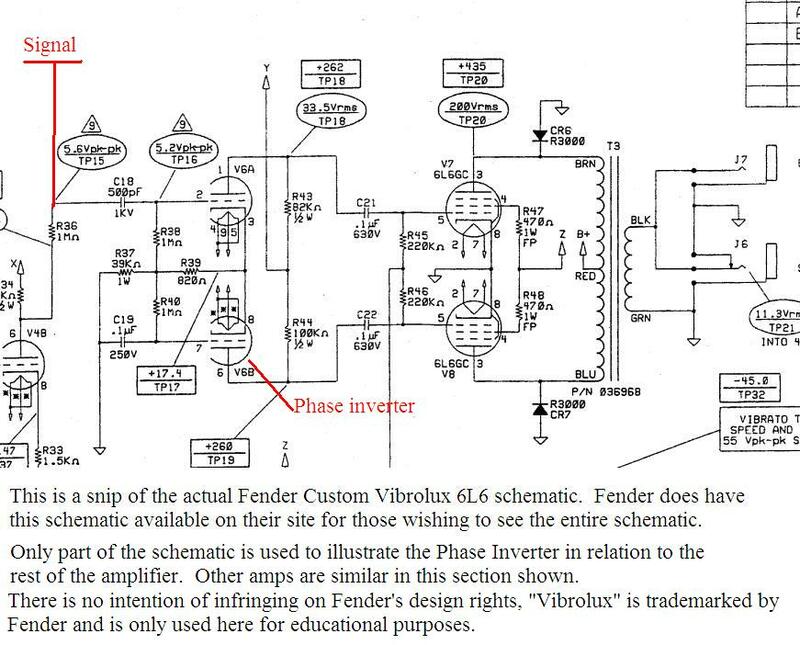 I am mainly addressing this to “Guitar Amps” and “Monoblock” amps, but stereo amps are similar in some respects as you can see in the image below at the bottom of the image. When you are dealing with guitar amps with some effects in them, the tube balance is critical to be close when compairing the 2 sections of a 12AT7 when used as a driver for a reverb tank. Other tubes can be used here depending who designed the amp, but in many amps, this tube is a 12AT7 wired so both sections of the tube are operating in parallel. These sections need to be close, and over time they will even out as the tube begins to age in the circuit if the tube is new or nearly new with only a slight difference in values between the sections, but over the course of a few thousand hours, and sometimes even a few hundred hours, the merit of the two tube sections begin to diverge again. In time, when it gets bad enough, you lose the reverb effect because the tube sections reach a point where they are inadequate to drive the reverb tank. In the image you can see part of the schematic, mainly that part where tube balance is best exemplified. V7 and V8 in the image are the 6L6 finals (Output tubes), and half of V6 is the phase inverter. Even though V6 does not introduce much gain into the circuit, it is one of the tubes where a close balance is desired. While I know the amp I built in an earlier post used random box pulls that were not tested, but still sounded decent that was by chance only. I fully expected a muddy sound because I at least knew the 6L6 series tubes I pulled were tubes that tested low when tested previously and did differ in merit, but I do hold onto these old weak tubes simply for initial testing in circuits just in case there is an issue- why risk a good tube in an untested circuit? But it was a demonstration that it is the circuit that ultimately determines the real merit of the tubes. When a tube has been checked for balance by various vendors you usually see “Gm” or the m can be subscript followed by a number. That number is units of “µMhos”. The relative conductivity of the tube or section of tube from which you can judge to some degree the merit of “Age” for the intent of balance. In other words, given a box of random tubes of a certain type, if you need to “match” them for the circuit they are to be in, you want them to be very close- Some may insist they be exactly the same value, but the reality is that if you are within 5%, (the Gm numbers differ only by 5% or less difference) you have a decent match, but the closer you can get to identical measurments, the better the match. Now, there are several Push-Pull topologies, I am not going into those descriptions here, I am simply discussing testing tubes and what someone should be looking at when testing tubes. When the output of an amplifier has just one ouput tube- it is considered “Single Ended” and in a stereo you would just want the 2 output tubes (1 in each channel) to be very close if not identical in performance (if a slight imbalance in audio can be heard, it can be corrected with the audio balance control when a difference is noted.). Now, when you get to tube stereo’s or 2 mono block amplifiers used for all intents and purposes as a stereo: when you are selecting matched tubes, the reason here is that when you have a 2 section tube such as a 12AX7, 6SN7, 6N7 and others- when they are used in the “preamplifier stages”, “Voltage Gain” stages/driving stages etc- One section of a 12AX7 or one half of the tube is handling one channel (right or left) and the other half of the tube is handling the same function for that other channel. In a dual monoblock setup you are looking to match the tubes so that the tube in one location of the circuit in amplifier “1” has the same values as the tube in the same location of amp “2”. This is true until you reach the phase inverter of a “Push-Pull” amplifier, and the finals or output tubes where for each amp you want balance in that amp’s finals or phase inverter when it is a multi section tube. Generalized tube locations and functions. In other words: referencing the image- V1 of Amp 1 should match V1 of Amp 2. V3 being the phase inverter should have both sections of the tube match*. V4 and V5 of each amp should match each other. if a “quad match” is sought, V4 and V5 of amp 1 and V4 and V5 of amp 2 need to match. 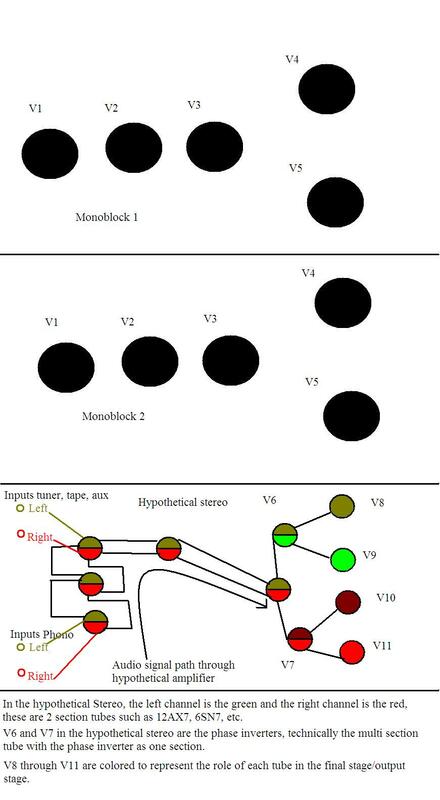 The image of the “Hypothetical Amplifier” shows a generalized signal path through the tubes, and should give an idea why stereos should have balanced tubes in their stages in a manner different from the monoblocks. Even though it seems there to be a difference between the 2 amplifier types, in approach to the process of tube balancing, it is actually the same process- to ensure the chatacteristics at each stage of the amplifier is the same for the 2 stages be they on one chassis or two. The ultimate test of merit of a tube is how the tube performs in the circuit. While a tester can tell you something about the merit of a tube within the circuit characteristics of that tester, the tube is normally not seeing the same circuit conditions with a tester that it sees in use. The ultimate final test is how well a tube sounds in a circuit. Some radios are not critical to what merit tubes they get, especially in series string heaters/filaments. So don’t automatically throw your tubes that measure “bad” or “?” in merit unless you are a dealer of tubes. Those weaker tubes however, you can wholesale at a Hamfest. Someone like me- I sometimes gamble on those tubes. Why? Because I have some secrets, and for some tubes- I have radios and other items that will work well enough with borderline and weak tubes that it does not matter too much. The only thing not discussed yet in this topic is the rectifier. If solid state rectification is used- no problem. If a rectifier tube is used, ideally you want the 2 sections to be close to identical if it is a “Full Wave Rectifier” like 5U4, 5Y3, 5V4, 80, 5AR4, etc. But there are times that may not be possible. In most cases, you can have a difference between the 2 sections of a full wave rectifier tube with a difference of up to 20% before a degradation of audio performance is easily noted, and where in the life cycle of the tube that difference develops in will also factor in. And while not usually given a great deal of discussion goes into these, it is largely due to the forgiving nature of tubes, it is something worth mention here though. Other Rectifiers, like the 35Z3, 35Z4, are “Half Wave” rectifiers and only have one plate and one cathode. As long as the device performs acceptably, you can run with these as long as you want to, but after a certain point sound quality degrades as does sensitivity. Bottom line is this- even if a tube tests low- Sometimes it “can” be just the tester, and sometimes not- but a tester should not be the final arbitter of functionality. Now that value you have from a tester is going to be arbitrary, but it still has a meaning. The measurement relates to how well the tube conducts between the cathode and the plate for that type. Testers vary, even when testing a tube on 2 different testers- usually 2 different values are measured. So having more than one tester is not a crime and is actually a good idea. The one tester I have the post on a few months back- it is actually more reliable for testing older tubes such as those mentioned above, but it also tends to test many of the 6S_7 series tubes lower than they test on a Jackson 648 or Sencore. Even numbers derived from an Eico 650, or TV7 series tester will vary, and they will sometimes vary significantly from an “Emission” type tester for the same exact tube. The latter 2 measure transcondcutance quite accurately when calibrated, and that type of tester tends to be used by the tube vendors. Now, tubes that were tested strong at the tester plate voltage of 150 to 170 volts, and their measurements are close, when they are in circuit and seeing 450 volts on the plates, they will in a vast majority of instances, perform as they are supposed to with minimal noise and minimal distortion (unless your goal is for massive distortion.). In other words, if the tubes are good on the tester, they will be proportionally about the same difference they were in the tester when in use. But “Hot spots” on the heater or filament that make a tube seem adequate in an emission type tester, may fade when in the operating circuit and in turn lead to degraded performance; a “Mutual Conductance” type of tester will usually be immune to false readings from hot spots. Now, when you have matching pairs, referring back to the 2 hypothetical monoblocks, assuming you have tested the tubes and paired them, and that V1-V4 are the same type, but you have a pair that measures at “120” on the tester, the next pair tests at “110”, the next pair tests at “100” and the next pair tests at “90”; usually you will have the best results with the highest ratings at the first tube (usually highest gain) of the amplifier section. followed by the next tube location getting the next highest, etc. Older tubes tend to develop some noise, and the less amplification of that noise is better achieved by having the best tubes in the early higher gain stages. As a real life example or compairison, the above paragraph is what I used to do with Tube type TV sets, especially with color TV sets (and while I did the same thing with black and white sets, there were fewer tubes of the same type number, but the principle worked there as well. ), was in situations where you have for example- 3 “6GH8” types as the three amplifier stages for video IF, I would put the highest measured value in that first IF section as it is the most critical. Purists would insist on realignment if this were done and especially if that tube came from a different spot- the reality is you do not need to be so picky about the alignment because the set when new was aligned to new tubes- not aged tubes, so unless you fully retube the set with new tubes, you are just making a lot of work for yourself when you really do not need to, and while there is some merit to the notion that the tube is going to age to the circuit it is in, there is only “some” merit to that way of thinking because the tube is itself going to age from use, it will change more in characteristics after 1000 or 2000 hours of use than the other components of the circuit short of a component failure. In this day and age where such sets are a novelty, kept as “retro” decor, or for sentimental reasons, the alignment is not so critical when the source is a digital converter box or VCR because there is only the one channel being used unless you are next door to a low power TV transmitter still broadcasting NTSC signals. (If your digital set is picking up extra blank stations, it is simply detecting the carrier signal only of either a low power station, or is processing some of the carrier of the stations you are recieving when they do not fall in the spectrum location the ASTC set’s program algorythm.). If major repairs are made with the video or audio circuits, such as replacing “IF” transformers, then alignment is likely needed for at least that one “IF”, but to set up the equipment and adjust that one, you may as well do the rest. Essentially the alignment peaks the set for reception sensitivity, color detection, “Quadrature” (for the NTSC color standard), audio and to reduce adjacent channel noise. The basis I used for this practice with used tubes developed from discussing with my dad when he was stationed in Labrador for the US Coast Guard. Most of their supplies came in via air drop from the PBY “Catalina” aircraft with only a few actual periodic boat landings. Even ruggedized tubes don’t do well, and sometimes shipments were lost due the wind pulling the parachute across the tundra. As a result, and due to their critical operation of the LORAN station there, when they would come up short in the routine tube replacements he would sit down and test the tubes they had used, and put those in the less critical locations of the equipment with no notable degradation of performance (if any). This kept them online and in a few instances, they were using tested used tubes in critical loactions because they did not have new stock for any of several valid reasons. I kept 2 different color TV’s going with acceptable color, reception and dot alignment for several years just by keeping the critical stages fed with the strongest used tubes (or new ones when needed) and doing it in this way while never bothering with alignment- they worked fine and I got adequate signal without any problems, but I would adjust the convergence for best picture clarity and color rendering once in a while using a simple computer program and an Atari computer hooked up tot he set to project a series of dots in strategic places on the screen. Unless the picture tube was replaced, alignment was not even considered. Now I mention a number of times now of letting the equipment be the final arbitter of the tube’s merit. This is simply because some circuits are not super critical to the tube’s “measured” value, and there is no question there are some pieces of equipment that are very critical of having even acceptable tubes from the tester not being good enough for the circuit (I have a Dumont scope like the one in the “Raj Mahal” which is that way.). Conversely I have a tube radio chassis that has all 5 of it’s tubes test below the question mark, and yet reception is very strong, sound quality is as good as a typical table radio and everything works as it should. In an audio amp, this leaves a grey area because people will listen for different things, from clarity (weak tubes usually lead to less clarity- Cymbals and “Hi Hats” tend to sound like static rather than as they are supposed to sound live. “Fricatives” become unintelligible in the spoken word when tubes get too weak and they sound like a drawn out hiss. This also leads to less clarity of the music, and which type of music you listen to- this is critical because some types of music have so much distortion in the music master recording that you cannot discern any difference- Classical music in general on the other hand is quite precise and therefore pretty good for audio evaluations. A song like Anjule’s “Boom”- is terrible for testing purposes. I am not being critical of the song itself, just pointing out that for testing audio it is just not a good candidate when you listen for clarity. People also wonder “what” they should be hearing when listening to tube audio. Me- I listen for clarity. I have a Sherwood S5000II rated for 80 Watts per channel. Right now I have it connected to a pair of KLH “9912” 3way speakers. I am not overly impressed with the KLH speakers on the Sherwood, but it is more a matter of trying to find the speakers that sound best to me paired with that amplifier. This is not to say the KLH are somehow “defective”, they are not defective, but they were made for a solid state amplifier so they tend to be a little bit damped in their response. I am also one of those who can taste the difference between Coke sweetend with HFCS (tastes like battery acid) Coke sweetened with Cane sugar, Pepsi and RC colas. It is just one of those things that simply “is”. No parsing intended. If you cannot taste the differences, no big deal. If you cannot hear any differences- again, no big deal, but understand people can hear differences. If you cannot hear a difference between a portable stereo and one of my audio systems, it is not a crime, it just means you likely do not have an apreciation for music or never heard live music, or just have not had some subtle differences explained to you in what you are hearing. Most people will automatically hear a difference even though they may not be able to explain why when they hear the same piece of music played over a decent tube amp and a decent solid state amp. In a similar and unrelated vein- people will usually see the color white as being a more truer white if there is just the slightest tinge of blue to it- blame it on genes, evolution, whatever you like. The fact is that any color viewed under daylight conditions will render different under flourescent and different under incandescant lighting. Or wines- to many, they all taste either astringent or like grape juice, but once a person learns “what” to smell for or “what” to taste for, they can appreciate the differences between Pignot Noir, Chardonay, Pinot Grigot, etc. But if you just buy the cheap wines, sometimes they will taste the same- sometimes blah, sometimes tollerable. It happens. If you happen to run at the sight of a “box” wine- you already know what I am saying. And when it comes to hearing- people are going to hear in the same piece of music different things in a different way. Most people do not hear the crickets in a city unless one is in their room or close by within the building. In that example it is more likely they just never purposely listened for them because they will hear them all over once they are pointed out or they make an effort to hear listen for them. In that same way different speakers will sound different when played through the same amplifier- there are some quantifiable and measurable differences with speakers and it is a matter of those differences within the speaker enclosure, the overlapping of the frequency rolloff of crossover networks within the speakers, the room shape, wall and floor treatments, box reinforcements etc. Many things can be quantified- but regardless; what I hear and listen for may or may not be what the Bose engineers listen for when not analyzing graphs of sound pressure levels and response curves, or anyone else. This is the realm where amplifier construction and design becomes an art form- because in spite of the quantifiable measurements- there is the human factor, the unquantifiable “Subjective” values that come into play, and sometimes- if you are not measuring the right things- you just won’t be able to measure it. I know someone who will at one moment describe how good his speakers sound, and then crank the volume to an uncomfortable level with Grateful Dead playing. Is his “ear” any better than mine? No, and I am inclined to believe my ear is better but the gist of it is simply this; it just means he does not listen for the same criteria I do. And some things which some take as a “rule of thumb” just are not true. Some people think a 12 inch speaker is going to automatically have a lower frequency response than a 10 inch speaker- which is absolutely not true. While the physics can support that as a general rule and it may be largely a truism much of the time, the voice coil size, the resiliance of the spider, the magnetic flux of the speaker magnet- all of those plus the cone material and the dust cover (that little bit of felt, fabric or foil over the center of the speaker) wire size, air gap, all of these factor in. But there are some 10 speakers and even some 8 inch speakers that have a lower frequency response than some 12 or 15 inch speakers can have (but not always and not automatically). The problems arise of mass and momentum of the cone with larger speakers because the combinations may not allow for adequate air movement to reproduce the lower frequencies audibly or accurately. This why 20 inch speakers (I had and sold a pair of them once upon a time) are not that common in home stereos- and the pair I had were made for a home stereo (a 1950’s or 60’s era Philco in fact), but they were huge. When I bought them originally at a yard sale, that put an end to further sales that day as I had no room left in the vehicle. But what I listen for is clarity of the sound- “can I hear the metal triangle playing in the background?”, “…does the music sound shrouded or tight and plastic?”, things that are quantifiable in a way, but not always easily explained. I have listend to all sorts of music live in person, and judge some of what I hear based on that experience- “Are the brass bright and clear and in balance with the rest of the music?”. Some music, such as Pink Floyd’s “Time” or “Dark Side of the Moon” should have a certain sound quality- the bongos should sound as if they are being played in a large auditorium and be “open” and “airy” while having some reverberation, and the bass chords should be able to be felt, yet still a bit airy and clean. This is what I listen for- but others will listen for other things. Some just want volume or sound pressure and if the speakers don’t distort or the amp doesn’t clip, they think it’s “good”, when in reality all they have is a great deal of noise. Noise is more common a problem in apartment buildings because they are not built with audio in mind, so over the years when people tended to listen to their music a little too loud next door to me, I had a wonderful combination of gear that shut down a “Grateful Dead” party moments after it began at 02:00 one morning. and at another time drove an ignorant individual to the point of blowing out their own speakers because they put their speakers on the wall common between our apartments. After the second one blew out his speakers it was only then they then decided it would be prudent if they moved them off that wall, but they tried to make do with scraping vocie coils for a few days and terrible sound that resulted. Good audio is not at all about being a menace with it, but there are times when you just get tired and circumstances warrant full volume practices, and when correctly matched pieces come together, the junk falls by the wayside. People get enamored with noise specs and THD (Total harmonic Distortion), well, most of those specs are generated at levels people are not going to be listening to on a regular basis, so the published specs are close to worthless. A more accurate measure is how noisy is the amp at full volume with no input signal. That “hiss” you may or may not hear is largely a product of what is in the amplifier, produced as spurious electrons in the audio chain- as your volume level goes up so does the amount of that audio detritus that you are hearing in the “hiss”. Hiss is NOT THD. Total Harmonic Distortion has to do with the noise that the applied signal generates in that amplifier. A 100Hz pure tone applied to a tube amp will have some 2nd order harmonics (200hz), some 4th order (800Hz) which are all “tonal”- while typically fairly small values in good tube amps, they are still present and part of the reason tube amps have a warm sound and a loyal following. If you go to a piano keyboard, say you press the white key between the 2 black keys at the left. Now go up one actave, this would be a second harmonic of the first, now go up 2 octaves from that key and you have the 4th order harmonic of that first key. If those were all played together, the chord would be okay to your ears. Solid state amps, have primarly third order harmoincs, which would be 300 Hz to that 100 Hz signal mentioned above. It is not quite as harmonious as the even order harmoincs, and even though the ratings for solid state noise are measured at sound levels you cannot tollerate for long, at normal listening levels, they are a little bit higher than the ratings, but because the amount is lower as a percentage overall and not as harmoious, the solid state amps tend to be sterile in sound- which is not automatically bad, but that “warmth” that tube amps have is a bit more difficult to achieve in a solid state amp, and many have tried. What about power? Usefull to have so the amp can reproduce low frequency signals cleanly at lower volumes, but there is a difference in ratings from old to new. The Class “D” amps which weight barely anything rely on “peak” power ratings. Not RMS. RMS ratings denote a comparable power level to that achieved by the same amount of energy equivalence to DC. Fact is most RMS values for class “D” amplifiers is quite low. 2400 Watts for example from a class “D” amplifier on a 12 volt circuit is 200 Amps- your car starter does not draw that much energy unless very worn or very cold. And that little shoebox amplifier is being fed with a wire that would more accurately be a fuse for 200 Amps- let’s be real here, the instantaneous power is only for a short portion of a second, where as the RMS value is the continuous value averaged over time. Plus the speakers themselves factor in as well. A low power amp, such as a 6Watt Push Pull 6V6 Amplifier with the right speakers attached will do nicely in small rooms. People get buried in numbers and specs as much as people get buried in minutae and in so doing they fail to appreciate what goes beyond numbers- the experience and the quality of the sound. I have another post in the works regarding how the tubes/valves work and how they are generally classified. This entry was posted in Amplifier repairs, Auditorium equipment, Cathode Ray Tube, CRT, Homebrew, Project, recievers and tuners and guitar amps, Repair, Stereo amps, Tube tester repair, Uncategorized, updating tube tester and tagged HiFi, High Fidelity, MonoBlock, Thermionic valves, Tube Amp, Tube Amps, tube merit, tube testing, Ultralinear, Vintage, Vintage Amplifiers. Bookmark the permalink.